Nocturnal is a thriller / horror novel by author Scott Sigler. The novel was originally launched as a work in progress rough draft at midnight on October 31st, 2007, in podcast form. A revised version of the novel was published by Crown Publishing in April 2012. Homicide detective Bryan Clauser is losing his mind. How else to explain the dreams he keeps having—dreams that mirror, with impossible accuracy, the gruesome serial murders taking place all over San Francisco? How else to explain the feelings these dreams provoke in him—not disgust, not horror, but excitement? As Bryan and his longtime partner, Lawrence “Pookie” Chang, investigate the murders, they learn that things are even stranger than they at first seem. For the victims are all enemies of a seemingly ordinary young boy—a boy who is gripped by the same dreams that haunt Bryan. Meanwhile, a shadowy vigilante, seemingly armed with superhuman powers, is out there killing the killers. And Bryan and Pookie’s superiors—from the mayor on down—seem strangely eager to keep the detectives from discovering the truth. Doubting his own sanity and stripped of his badge, Bryan begins to suspect that he’s stumbled into the crosshairs of a shadow war that has gripped his city for more than a century—a war waged by a race of killers living in San Francisco’s unknown, underground ruins, emerging at night to feed on those who will not be missed. And as Bryan learns the truth about his own intimate connections to the killings, he discovers that those who matter most to him are in mortal danger…and that he may be the only man gifted—or cursed—with the power to do battle with the nocturnals. Similar to the author’s first book, EarthCore, the book release of Nocturnal followed a non-traditional path to print publication. The following timeline details the distribution lifecycle of the novel that culminated with the April 2012 print reboot. The Translations Page also provides a comprehensive listing of languages available for this novel. Hardcover (ISBN: 978-0307406347) U.S. Crown Publishing April 3, 2012 Amazon.com U.S. Paperback (ISBN: 978-1444700961) Hodder & Stoughton April 12, 2011 Amazon U.K. The 2007 rough draft podcast version of Nocturnal used the song Remember Your Ghost by the band Uncrowned. For a comprehensive list of music used in the podcast versions of Scott's works, refer to the Theme Music page. 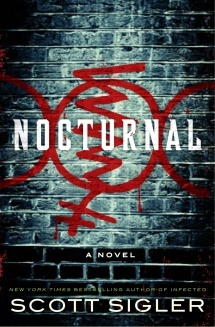 Continuing in his innovative style, author Scott Sigler’s original 2007 version of the novel Nocturnal was released amid a contest where randomly chosen fans will have their names appear in his novel. The luckiest of the fans also had their character die a horrific and untimely death. The following link references a table dedicated to tracking these fan-named characters with indicators of which characters become victims. This page was last modified on 6 July 2017, at 21:02.